Doing a search for "Wallpaper" apps in the App Catalog that switch your device's background yields dozens of results ranging from free to $5. While all of these apps will provide you with different categories of photos to use as your background and varying settings on how and when to change it, they all have one thing in common: none of them will simply use the images on your device. For users still on webOS 1.4.5, the homebrew app Switcharoo Free was able to do this using unsupported APIs, but all that broke in webOS 2.0. The closest we came to resurrecting an on-device wallpaper switching app was Slide RSS by Appsotutely for $2.49 that contained a way to "load" in your local albums to use for switching, but it was only one piece of a much larger app and it didn’t work if you had more than a few hundred photos on your device. As with other apps, it didn't "simply" allow you to use your own photos. 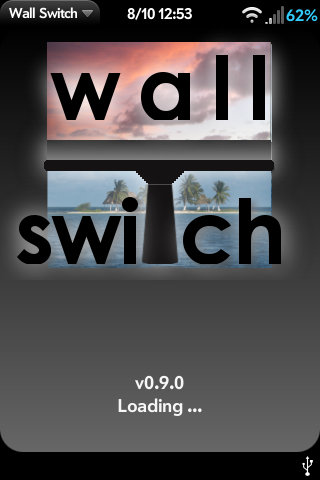 During a discussion between myself and the developer of Slide RSS at a NYC webOS Meetup, he decided to accept the challenge of creating a worthy successor to Switcharoo Free that would allow easy wallpaper switching using on-device photos for webOS 2.x users, without the need for significant set-up by the user. 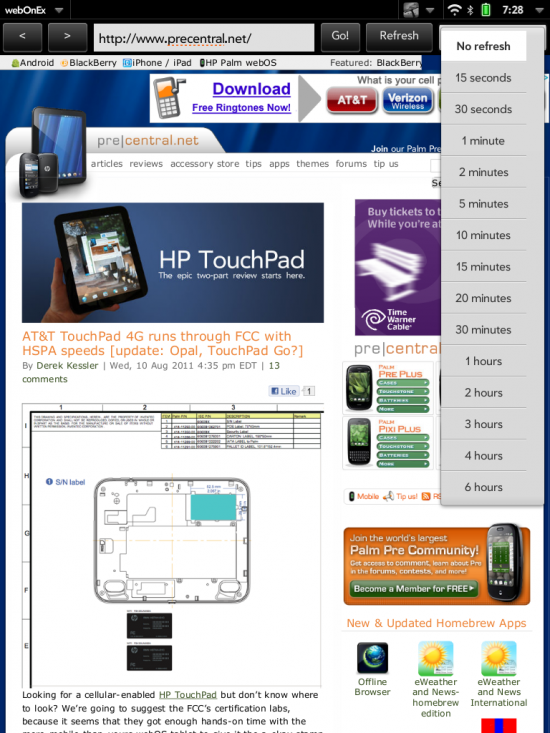 NOTE: You must be running webOS 3.0.2 in order for Camera to function properly. You should check your current webOS version and if you are running webOS 3.0.0, open up the "System Updates" app and spend the next 30-45 minutes updating to the latest version of webOS. Sitting atop the TouchPad's screen is a 1.3 megapixel camera that blends nicely into the bezel of the device, but is basically useless unless you decide to load up a Skype Video call on the device. You have no native access to the camera, therefore there is no way to take any kind of pictures or videos with the TouchPad. That is, until now. 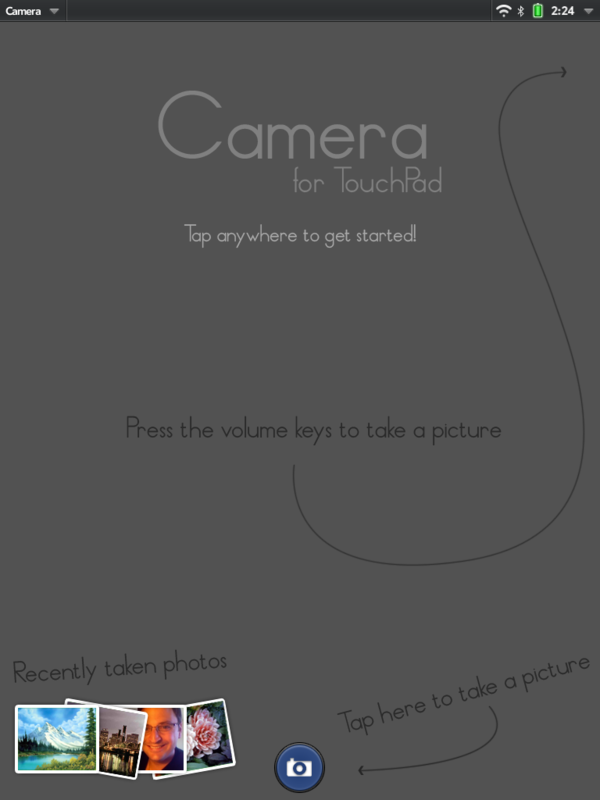 Keen Studios, developer of the popular Checkers app, has released an app for 99 cents simply titled Camera for TouchPad that allows you to take photos using that front facing camera. If you are a developer and you decide to write a calculator app, you need to make sure that you bring something unique to the table, especially if you are going to charge for the app. After all, there is no reason to pay when you can just use the stock calculator app that was just added with the webOS 3.0.2 update, right? So what type of unique features can a calculator app have to differentiate itself? Maybe it can do advanced scientific calculations or can solve complex financial equations. Or maybe it’s a replica of an old-school HP calculator. 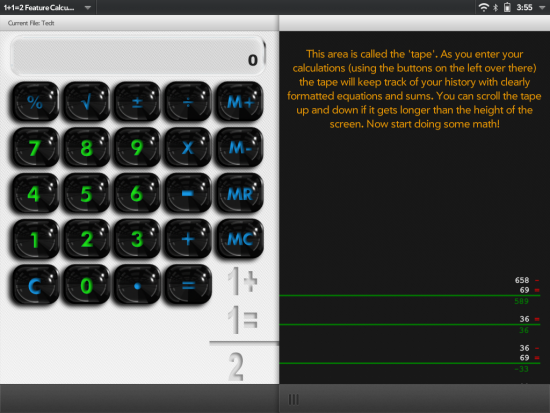 In the case of 1+1=2 Feature Calculator by Ryan Gahl, available for 99 cents in the TouchPad's App Catalog, it's the ability to see a running tape of all your calculations and being able to save those tapes for future reference. Although the developer has long-term plans to add additional calculator functions, 1+1=2 exactly matches the stock calculator app in terms of basic math functions. Aside from the typical addition, subtraction, multiplication and division, it has percentage, square root and ± buttons along with M+, M-, MR and MC memory options. But unlike the stock calculator app (and I believe all other apps in the catalog), as you tap on the buttons and perform the calculations, you get to see the running totals along the right side of the screen. This is called the "tape", referring to the old calculators that would keep a roll of paper (or tape) that would print out the results as you calculated them. You can even scroll up or down in the tape if the calculations get pushed off the top of the screen. MakleSoft has been making plenty of news this week. 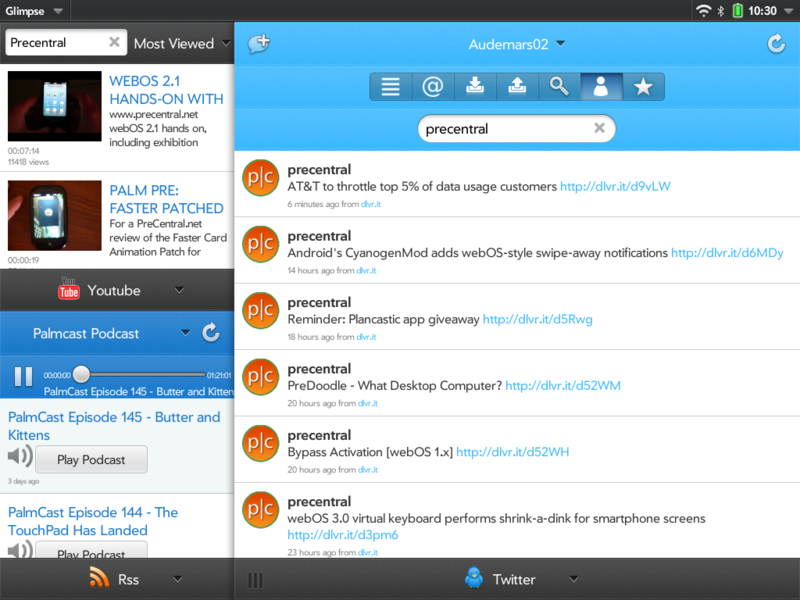 They're giving away 100 copies of Plancastic for webOS smartphones, they've released Advanced Browser for the TouchPad and are giving it away this week, and they've put their last app, SecuStore 2, on a 33% sale to get the app into as many hands as possible. 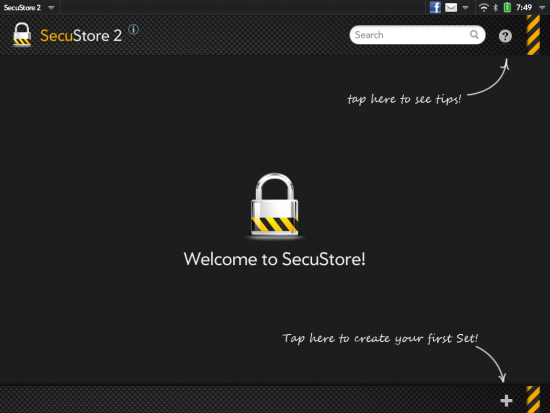 It's SecuStore 2 that caught our eye today, though, and we thought it would be important to give you a full review of the app that was built to keep your data secure and encrypted on your TouchPad. At the current price of $9.99 (which will only last until tomorrow, so get it now! ), SecuStore 2 sits a bit more expensive than most other apps in the catalog. Is it worth the price, though? It would be easy to say yes if the only thing that it did was store our passwords in a secure way; security for us should just be that important. But because the developers have taken the app even further beyond the calling to create a tool that every TouchPad owner should not go without, the price is most than justified. Keep reading after the break to get our full review, but be quick to hit the app catalog as well and take advantage of the on-sale price before tomorrow! 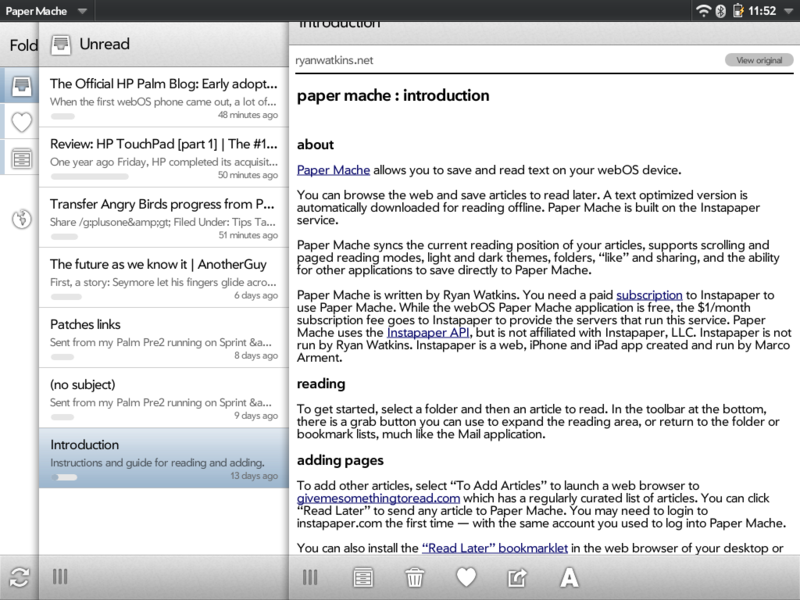 If you are an Instapaper user and a TouchPad owner, Paper Mache is a must-own app for you. For those not familiar with Instapaper, it is a free service that allows you to mark websites that you want to save for later if you don't have the time to read them right then. After adding articles to the service, you simply access the Instapaper.com website from any desktop or mobile device and you can easily see all your read or unread articles. It's sounds very similar to an online RSS reader like Google Reader in that will keep a list of unread/read articles for you to check out from any network connected device, but instead of subscribing to entire feeds, you just mark specific articles from anywhere on the web to check out later. In fact, Google Reader and Instapaper work quite well together in that you can clear out your Google Reader feeds yet still identify which articles you may not have time to read until later. One other nice feature of Instapaper is that they provide an optional "text optimized" version of the most websites, so when you are reading on a mobile device it reduces the amount of network data you need to download and increases the speed of your reading experience. But enough about Instapaper, what about Paper Mache? Paper Mache, by Ryan Watkins, is an app that will sync with your Instapaper account, allowing you real-time access to all of the same data that you would normally have access to on the Instapaper website. While the Instapaper website was designed for mobile viewing (specifically for the iPhone) and looks quite nice on the TouchPad's browser, a native app does bring a few advantages to your reading experience. But before we get to the app, it's important to note that while both Instapaper and the Paper Mache app are free, an Instapaper subscription is required to access data in apps such as Paper Mache. The subscription costs only $1 per month and is billed to the developer of Instapaper (not Paper Mache) in 3 month increments via paypal. At the moment, the only benefit of a subscription is the ability to use these types of apps. So let's talk about Paper Mache. Upon loading up the app and providing your log in information, you will see three panes across the screen in a very similar fashion to how the email client works. On the left is a folders navigation pane, followed by your articles listing within a given folder, and finally the selected article on the right. You will also see a new Paper Mache Introduction article has been added to your unread articles list to give you an overview of the app. In the folders pane, you will always have a Unread, Liked and Archive folder plus any custom folders that you have created below that (these folders do sync to/from the Instapaper website). On the bottom of this pane, there is a sync now (refresh) button and a button to add a new folder. Task management has been a core functionality baked into Palm’s DNA since it's humble beginnings in the early nineties. Certainly for the average Mobile Accomplisher, having some method of organizing a list of to-do items is a must-have feature, arguably as important as calendar, contacts, and e-mail. With the advent of webOS back in 2009, there were definitely a few jeers at the performance of the built-in task manager, but if nothing else, at least it was there. Fast forward to July 1st and the launch of webOS 3.0 on the TouchPad, and even a bare-bones application for managing tasks was nowhere to be found. Fortunately for those of us looking to add a webOS tablet into their daily workflow, an effective remedy quickly became available thanks to the efforts of Prodisoft in creating toodleTasks. 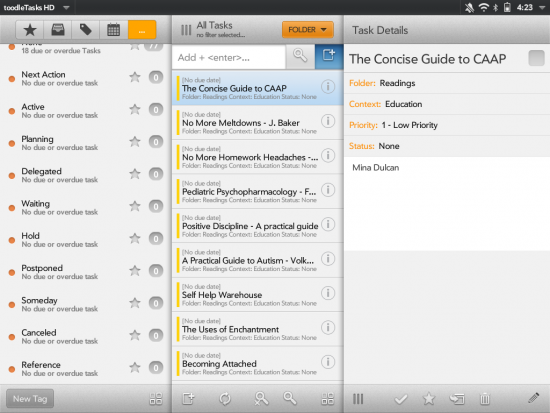 toodleTasks, as the name implies, is a full-featured task management app that synchronizes with Toodledo, a free, web-based task management solution. Just enter your login information for Toodledo into toodleTasks and all your to-do items are pulled down from the cloud. If you were to ask our PreCentral readers for the best File Manager app for webOS, everyone would probably respond with a quick answer of Internalz by Jason Robitaille. Of course, Internalz (and the homebrew Internalz Pro) have really been the only file manager apps available for webOS for the last couple years. 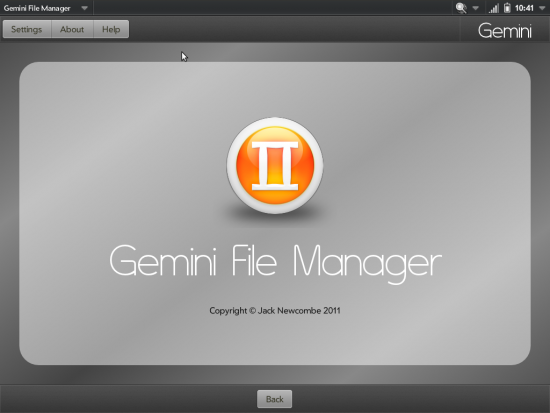 That is, until now, with the release of Gemini File Manager by Jack Newcombe of Oma Studios. Developed specifically for the TouchPad and webOS 3.0, Gemini File Manager is $2.99 in the App Catalog and brings some serious competition to the File Manager space, although it is fair to note that while Internalz is able to run as a full screen Mojo app on the TouchPad, Jason is working on bringing his own TouchPad version of Internalz HD to the catalog in the not to distant future. Regardless, Jason has his work cut out for him because Gemini has a whole lot going for it in terms of functionality and even looks great! In the category of image editing software on webOS, there are only a few fully featured apps in the catalog that process your edits directly on the device. 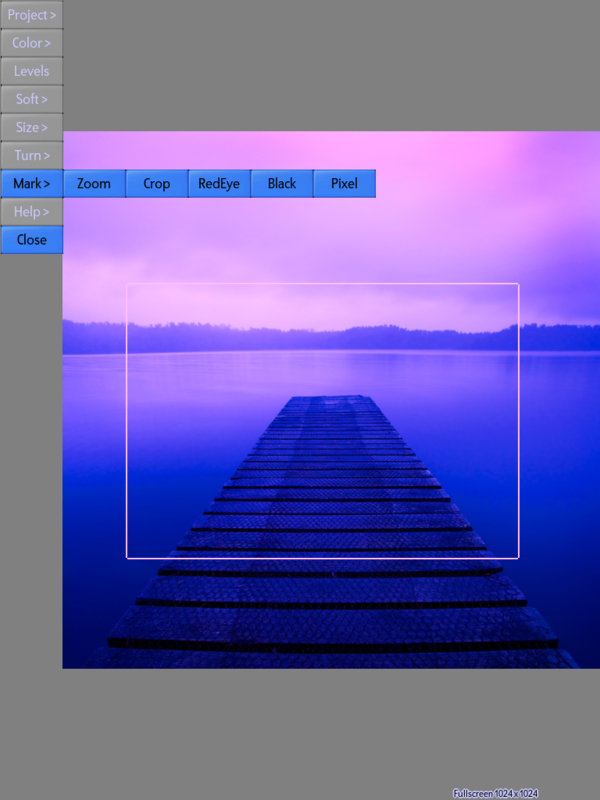 We have previously reviewed Photo Effect Pro (for phones) and Photo Effects Tablet Edition (for the TouchPad), but another option for you is Image Worker Pro for $2.99 by prolific developer MetaView, who is responsible for a large number of both official and homebrew apps/patches. Unlike the Photo Effects apps that are hybrid apps (Mojo for PE Pro, Enyo for Tablet Edition), Image Work Pro is a full on PDK app which bring some interesting pros and cons along with it. As a PDK app, it's not able to take advantage of the standard webOS interface that most people are familiar with, which necessitates things like the need to build a brand new interface to navigate the device to find the photo you want. That mean you have to know where to look to find a given subfolder or even know that the "Photo Roll" is located within the DCIM/100PALM folder on your device. But, one big benefit of being a PDK app is that as long as you have the same webOS Profile on your phone and TouchPad, the same app will run on both without the need to purchase duplicate apps for your different devices. Finally, unlike mojo hybrid apps that require a minimum webOS version of 2.1, Image Worker Pro will run on almost any webOS device on the market, as it requires only webOS 1.4.5.